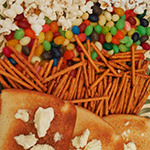 Edible Stocking Stuffers! | Dinosaur Dracula! 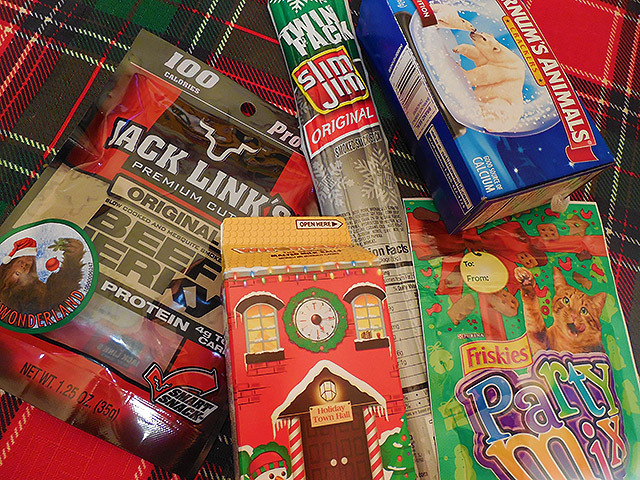 I bought a big pile of edible stocking stuffers. Most of you would probably avoid these, whether because they’re made of dried meat or because they’re actually meant for cats. Me? I don’t discriminate. I love all stocking stuffers. Here are 70-100 words about each. Oh, so it’s “Jack Link’s?” I always thought it was “Jack’s Links.” Which I guess makes no sense. There’s nothing linky about jerky. I’m off to a great start. 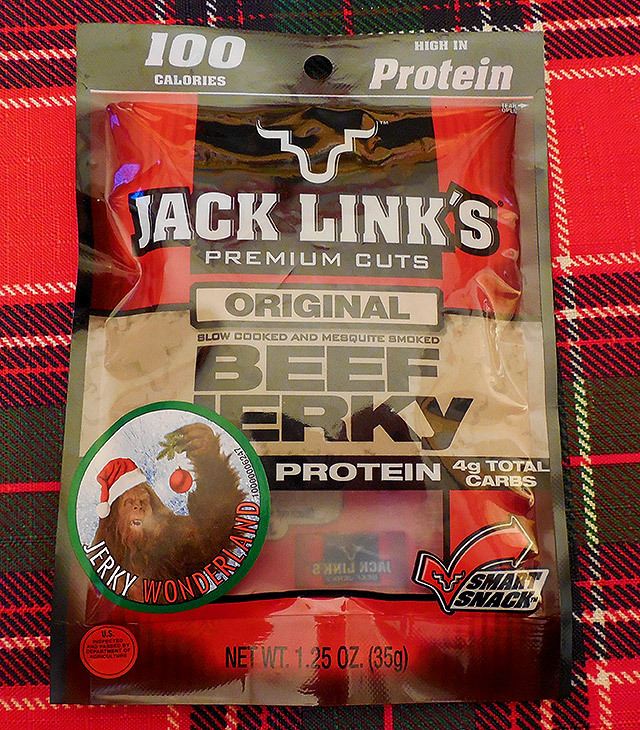 Jack has been peddling these mini-bags as stocking stuffers for a long time, but I never really bought it until this year. It wasn’t so much an epiphany as a natural reaction to the newly included BIGFOOT IN A SANTA CAP stickers. Holy jeez, those are fantastic. It’ll take a lot of fingernail finesse, but that is so going on the front cover of my diary. 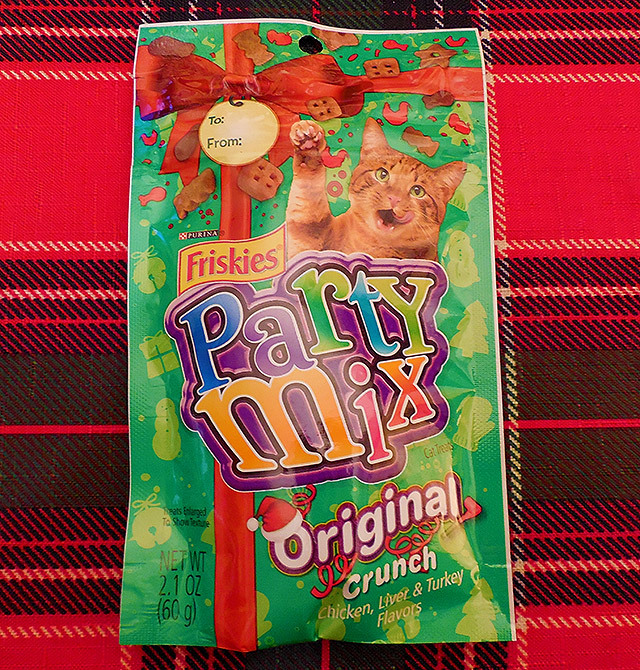 Friskies Party Mix Cat Treats! 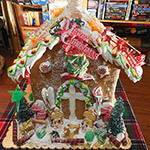 My only complaint is that the treats themselves aren’t holiday-shaped. This would mean so much more if I could feed my cats condensed livestock organs in the shapes of mittens and Christmas trees. Songs have been sung over a lot less. 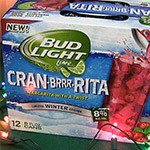 On the other hand, the packaging is pretty festive. They even built in a “to and from” label! I’m mostly excited about the featured cat’s Photoshopped tongue. Purina loves to Photoshop cat tongues, and subtlety is a dirty word whenever they do it. They look less like natural body parts and more like alien slugs who force “cleaner shrimp / moray eel” relationships on a bunch of cats. I should’ve glued a little shark fin to Gray Cat’s head. Coulda ruled Tumblr. 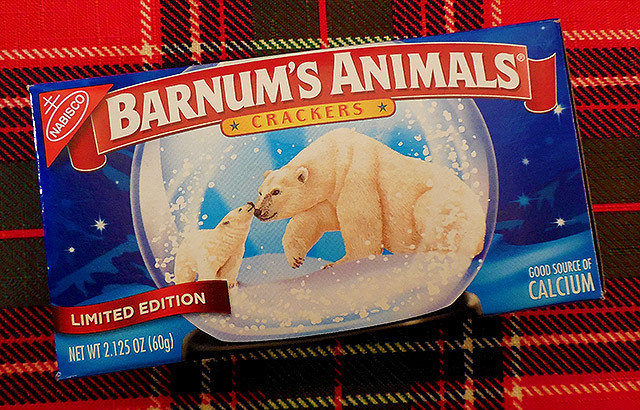 I was excited to see these, believing that the crackers would strictly portray “wintery” animals. No such luck. It’s the same bunch of lions and camels and sheep. 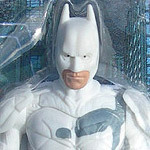 What was all that “limited edition” stuff on the box about? I refuse to accept “well the boxes show polar bears in a snow globe” as a reason to call something “limited edition.” No. On the bright side, I think I have all of the necessary animals for a Christmas manger. Or most of them, anyway. I also seem to have a kangaroo with a backwards horse head. 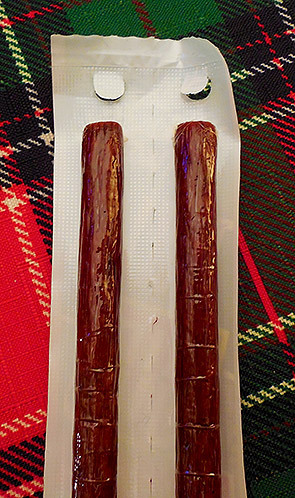 Two extra long Slim Jims in a package adorned with snowflakes. One look at the nutrition facts confirms that Slim Jims are treats best left in the past, when Macho Man was making them seem like power pellets. I just did some math. It was hard, but I did it. 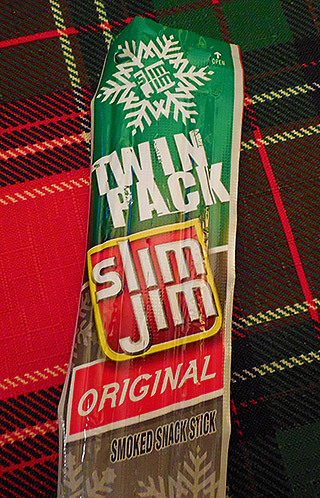 One Slim Jim has the same amount of fat as *twenty-three* Jack Link’s mini-bags. 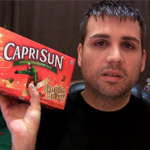 What the hell is in these things? 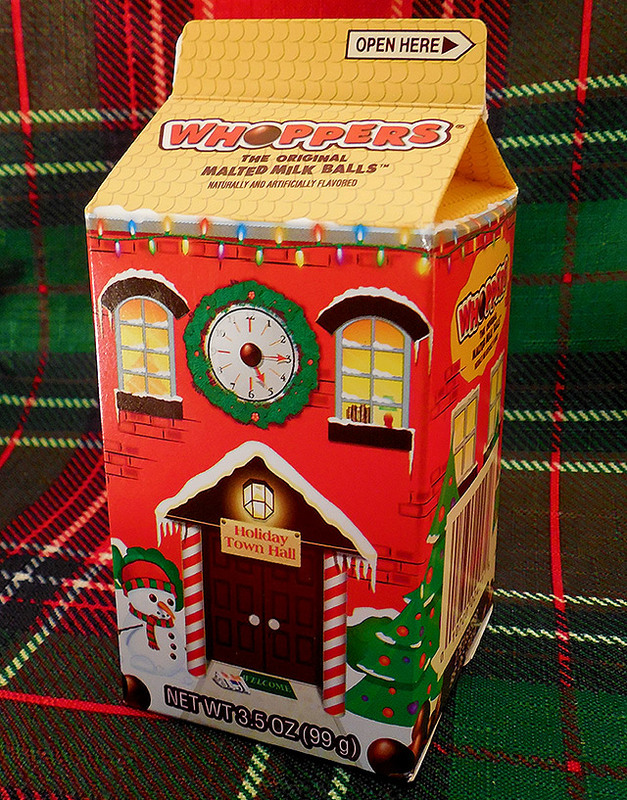 I doubt I’ve eaten more than five Whoppers in my entire life, but I couldn’t resist this miniature milk carton made to look like a brick Christmas house. I love the idea of the Whoppers serving as tenants. They’re all inside, doing whatever it is Whoppers do when they think nobody is looking. No Whopper ever wants to leave, which makes sense, because the ones that do end up being crushed to death by giant teeth two seconds later. That makes the decision to eat even one Whopper something that should be carefully considered. Do I want a malted milk ball enough to end one life and spread paranoia to twenty or thirty more? Can I live with myself knowing that even the Whoppers that survive will spend the rest of their days in constant dread, huddling together with a “schooling fish” mentality, secretly praying that the next victim will be one of their roommates? Is NaNoWriMo still going on? I want this story to become a book, but specifically a book written in three hours. 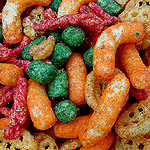 Whether you pick one of these foods or an entirely different food, I must insist that you stuff ALL stockings with SOME type of food. It’s critical to the presentation. Same with deodorant. Nobody asks for these things in their stockings, but they need to be there. Christmas morning isn’t Christmas morning unless we’re making mountains out of 79 cent molehills.